My Attempt to Cook 100 Jamie Oliver's Recipes : Attempt #60: Gorgeous Roast Vegetables - JO style! 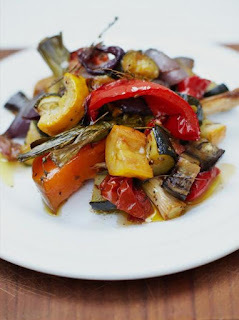 Attempt #60: Gorgeous Roast Vegetables - JO style! Lesson learnt....do not, I repeat...DO NOT drizzle too much oil into the pile of lovely vegetables. I had this lovely duck oil / sauce with me and it was so tantalizing to the taste buds that I drizzled more than the 6 tablespoon recommended in the recipe.